So that day came with job transfer of my father and he has to move to another province. Those days my memories have attached to the river I had bathed, ducks and that ‘Soldare’ (Upstairs) in my friend’s house. But I do not remember the feelings I had when we had to leave that place. But I was happily ready to go to the new house. All the goods of the house have loaded into a big lorry and there were a few friends of my father to support us. But I do not remember how I left my friend and I could not remember whether she was there or not even. She was not there, I think. So, this is the most precious incident happened on that day and I would say that’s the most remarkable worship/respect I did for an elder during my lifetime. Among many elders, I choose our take carer’s (‘Renuka’) mother also as a suitable elder to say goodbye by following up our tradition. If you exactly do not know the way we are following up this tradition, I will try to explain it in this way. This is actually kind of a respect that we are showing to our elders as younger. Here we should keep our knees, hands and head on floor by bending back well in front of elder’s foot. At that time, as a child, I might not think about her as our baby sitter’s mother. Might think as a mother of a person who is a good example for kind hearted human being. There are many reasons to say that ‘Renuka’ was the best lady who looked after us well among many in our childhood. 🤗 I don’t know how much of patience she had when thinking about my patience level with my sister’s little one. I used to manage my patience very hardly when I had to take care of him for few hours. However, ‘Renuka’ was a very kind-hearted person who loved us a lot and looked after us for many years. I used to drink milk only if it has prepared by mother or ‘Renuka’ in those days. However, I still feel that lady blessed me with her honest thoughts. When I was worshiping her, she told me many things as blessings and hugged me. The real tears in her poor eyes touched my heart and I felt happy with her companion that day. 😘 Sometimes it might be a memorable moment for her as well even though she also bit confused and inconvenient due to unexpected incident. The other memorable worship happened when I was in grade one. Before leaving school, we should strictly follow up this custom by respecting our class teacher. So, all of our classmates were standing up in a queue to do this tradition before they leave. For some reason, instantly, I went over some tables without waiting in queue and worshiped my class teacher. It may be the rush I had to go home. However, the way I worshiped was not perfect and I did it without bending my head much. My teacher noticed my behavior and asked ‘Don’t your parent teach you the way of respecting us’ by consolidating all the faults I did at that time. Now you me and god know how I have worshiped and respected elders right. 😮 Lol.. Even I did not tell this to my mother, later on she got to know it from a few of my classmates’ mothers. However, after this incident, I used to worship them by keeping my hands, knees and head on the floor by bending my back well. Specially I didn’t make this mistake again when respecting teachers who taught me. I remembered this incident every time when I have to respect them. 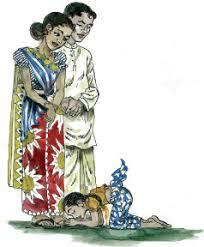 So, all discussed things were certain special incidents in my childhood with regards to respecting elders. On the other hand, there was another practice when saying goodbye to my friends. On those days I hugged and kissed my friends when leaving school as a good-bye practice. 🤗 So, I used to hug my every girl and boy friends and thought it shows my friendship to them till I meet them on the next day. Most of the time I came back with my mother or a lady who looked after us and they saw this practice many times. But there were no objections from them. But this practice has totally stopped in one day when my father came to pick me from school. So, as usual, I hugged my every friend and came back home with my father. It was totally fine on that day, but my father observed this practice when he came to pick me on the next day as well. Very recently I got to know that sad and unpleasant thoughts are also sin after listening for a preach of Thero ‘Thiththagalle Anandasiri’. This entry was posted in Asian Culture and tagged adults, Asia, care, childhood, culture, friends, good bye, memories, Practice, respect life, School. Bookmark the permalink. Will Guts die at the end of the new season of Berserk ?